Wash a wide-mouth 1-qt. canning jar and lid in hot, soapy water and rinse well. Set a round metal rack or a few biscuit cutters in a stockpot, fill with water, and bring to a boil. Lower jar into water, add lid with ring, and boil for 10 minutes. Reduce heat to a simmer and keep jar and lid in water until needed. Immerse mushrooms in a large bowl of water and swish around quickly to remove any dirt. Lift out to a colander to drain, then cut mushrooms in half. Put mushrooms, vinegar, 2/3 cup water, garlic, 2 sprigs thyme, chiles, and salt in a 4- to 5-qt. nonreactive pot. Bring the liquid to a boil, covered, then reduce to a simmer. Cook, covered, until the mushrooms have shrunk considerably and are glossy and more tan in hue, 8 to 10 minutes. Put remaining 2 sprigs fresh thyme into jar. Set a wide-mouth funnel in jar and spoon in mushrooms, chiles, and garlic (discard cooked thyme). Pour brine over mushrooms, leaving about 1 in. airspace at top of jar. You can also make a more unctuous pickle with oil instead of vinegar: After you cook them, take them off the heat and let sit in the pot for 15 minutes. Put them in the jar with a slotted spoon and cover completely with extra-virgin olive oil. Close the lid just until tight. 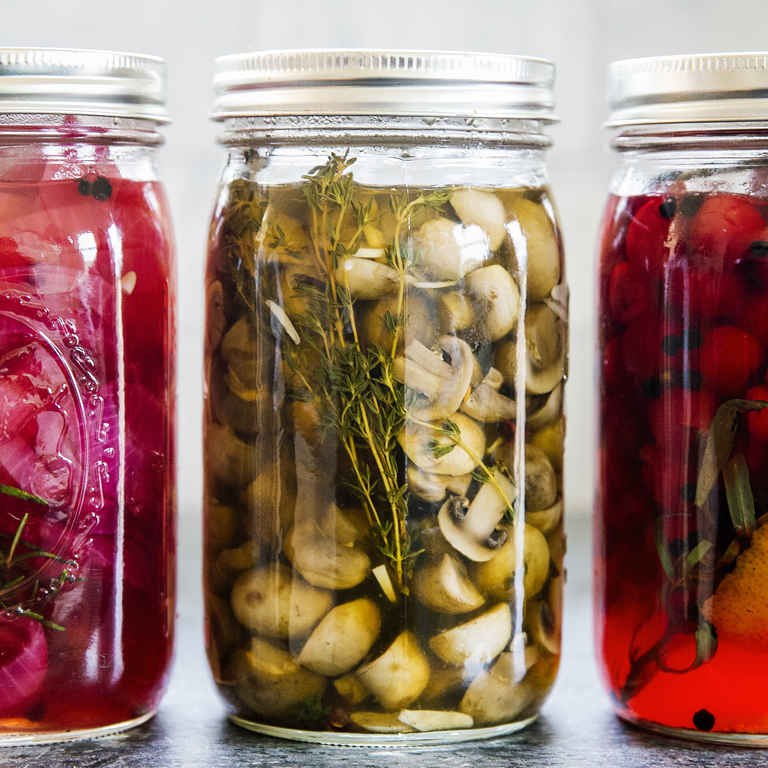 Let the pickles cool to room temperature, and then chill at least overnight before eating and preferably 1 week. Make ahead: Up to 6 months, chilled.